Just because you're in your 50s doesn't mean you have to settle for a boring hairstyle. At this time if your life, you should be able to rock any hairstyle you want, regardless of age. Plenty of celebrities serve some serious hair inspiration. Whether you want to make a big chop or just switch up your regular style, we've got you covered. 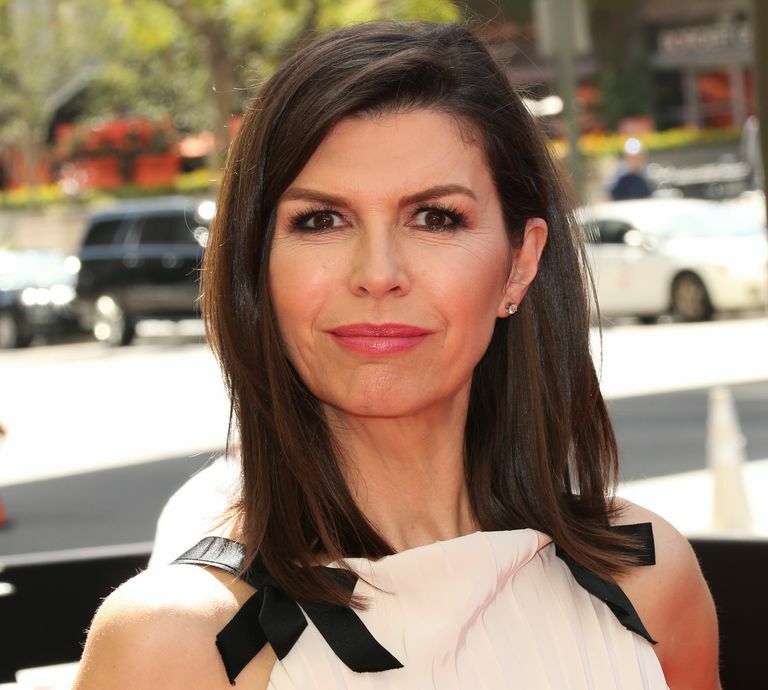 Finola Hughes (born October 29, 1959) has a haircut that's flattering on all face shapes and hair textures. It's shoulder-length, has a few layers for movement, and is simple to style. After washing, simply blow dry your hair and straighten it if you really want your layers to stand out. Changing up your appearance can be as simple as lightening your natural hair color. A lighter color can brighten your face and bring attention to your facial features. Catherine Keener (born March 23, 1959) has a red tint to her natural brunette color in this image. Long, healthy hair never goes out of style. Demi Moore's (born November 11, 1962) hair is long with some slight wave, adding texture and movement to her style. If you choose to grow your hair out, make sure to give it some extra love and condition and trim regularly to prevent split ends. Michelle Pfeiffer (born April 29, 1958) has naturally curly hair, but often wears it straight. If you want to skip straightening and blow drying your hair after each wash, you can chemically straighten your hair. But keep in mind chemical straightening isn't for everyone. The chemicals can be harmful to lungs and skin. There's nothing wrong with embracing your natural curls! Sandra Bullock wears a youthful, beachy wave in her chestnut hair here. Bullock (born July 26, 1964) normally wears her hair long, making sure to add texture and so her hair doesn't fall flat. Try a sea salt spray to add that lived-in look to your hair, too. Jodi Foster (born November 19, 1962) flaunts a gorgeous strawberry-blonde lob, which would be universally flattering on nearly all face shapes. The lighter color also brings out her blue eyes and glowing skin. Kelly Lynch (born January 31, 1959) used to be known for her super long blonde tresses. But, in 2012, she proved that she can work both long locks or a modern lob. No matter the style, her signature middle part shows off her face, letting her natural beauty shine through. Ann Curry (born November 19, 1956) continues to prove that shoulder-length hair is universally flattering. She flaunts fun layers that add movement and volume to her sleek hair. A super flattering cut on all women is shoulder-length hair. Choosing to part her hair slightly to the slide flatters her slender face instead of cutting it in half like a middle part may have. Rita Wilson (born October 26, 1956) is proof that the ombre hair color can be pulled off at any age. The additional color adds dimension to her dark hair, and draws eyes down her face, making it appear more slender. Sharon Stone (born March 10, 1958) rocks a short, textured pixie. The different shades of blonde in her hair add dimension and depth, while the deep side part draws attention to her bright blue eyes. Former first lady Michelle Obama seems to always be sporting a chic, sleek haircut. Her hair grazes her collarbones. Normally, she keeps her hair straight, showing off her fun layers. Her slight side bangs graze her high cheekbones, highlighting them. Julianne Moore (born December 3, 1960) rocks her long, red hair with minimal makeup. For those of us who aren't blessed with gorgeous red hair, regular coloring appointments may be necessary to keep color from looking too faded. Since her hair is brilliantly colored, she doesn't need a crazy haircut to add visual interest. The color speaks for itself. Andie MacDowell (born April 21, 1958) wears her hair in natural, flowing curls. Normally, curly hair behaves better the longer it is, since the weight of the hair can keep curls from poufing out. If you've got thick curly hair, adding layers may help remove some of the weight in your hair. Short bobs and pixies don't have to be boring. Tilda Swinton (born November 5, 1960) proves that a platinum blonde bob can be edgy and refined. Having the top of hair cut longer than the sides, slicked back or as long bangs adds feminine flair. The layers allow for an edgier, tousled look on the weekend or a slicked-back look for the office. Marcia Cross' (born March 25, 1962) soft waves frame her face, while her color puts all eyes on her. To achieve a similar look, wrap your hair around a large barrel curling iron and lightly curl hair away from the face. Yolanda Foster (born January 11, 1964) styles a blunt bob with swooping side bangs. Her platinum hair is gorgeous with her darker brows, and her bangs frame her face.